Views From the Lamb's Herd: Goodbye, Delicious! This is big news for those of you that use the service. Delicious was one of the early sites that allowed for social bookmarking. 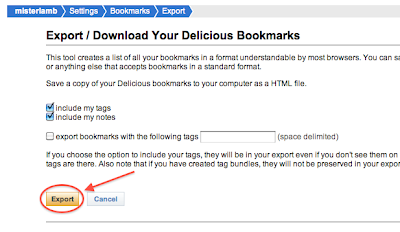 Instead of just bookmarking a site for you to visit at a later time, Delicious allowed for bookmarking online, so you (or any number of friends/colleagues/students) could also access the same bookmarks anywhere in the world, as long as they could get online. After reaching great success, Delicious was bought by Yahoo! But now Yahoo! seems to be ready to drop the service. There is a possibility that customer feedback might force them to keep the service a bit longer, but don't hold your breath. So, if you use this service, now might be a good time to back up your bookmarks and upload them to a new service. Steps will be provided after an exploration of an alternate service. One service that could act as a replacement to Delicious is a service known as Diigo. 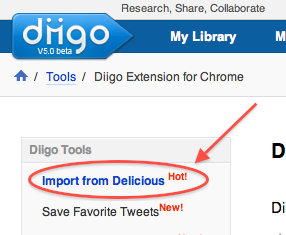 Diigo, like Delicious, allows for bookmarking and sharing over the web, but it also includes a few features, including groups. The use of groups allows you to not only share bookmarks in your own list, but also in a list that you share with others. I use one with other Pennsylvania instructional coaches (formerly CFF), educators on Diigo, and there is even one for virtual manipulatives for math. If you are working with students and want to easily share a series of links to websites, creating a group in Diigo is one great way to do that. Create a group for your classes by period or by content area (government, geography, etc.) and allow the kids to not only access the links, but also share with the group as well. When bookmarking, remember to enter tags to help organize your bookmarks and also add short descriptions to provide information as to what can be found on the site. If sharing with a group, just select that group when sharing. Below is a screenshot of how you would bookmark in Diigo using their new Google Chrome extension. You can find extensions for various browsers here. You will notice in the screenshot that there are also options to bookmark a site as private (only you see the bookmark) or to read later. Other tools allow for open discussion of items on the page. You can highlight important text (again, both privately or publicly) as well as leave a sticky note to share ideas about the content with other readers. 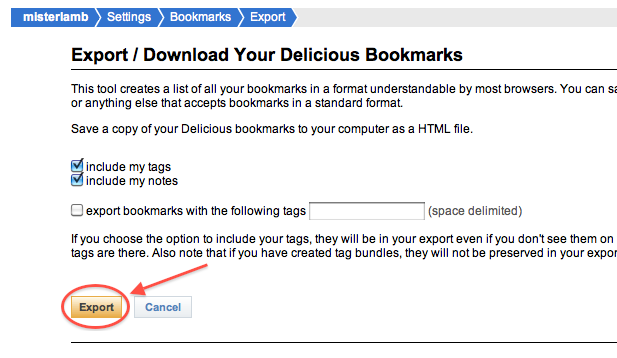 So the real question now is how do you get your Delicious bookmarks into Diigo? You can follow along with Diigo's instructions, or follow the screenshots below. 1. Sign in to Delicious. Select "Settings" in the upper right hand corner of your screen. 3. Export your bookmarks. This will create an HTML file that will allow you to import your bookmarks into Diigo. Make sure you do not change the extension on the file, and be aware of where it is being saved. 4. Sign in/create a Diigo account (it's free!) then select "Tools." 5. Select "Import from Delicious (HOT)" from the list on the left. This is a feature that is being used quite a bit since the announcement. 6. Select your HTML file that you downloaded in step 3 and click the "Import Now" button. You will now have all of your bookmarks saved in Diigo. Diigo also offers an educator account here. You can upgrade an existing account if you did not know about this. While in the educator account, you can create class groups there. Learn more about the educator account here.